This new Indie Game that is really poorly designed, but somehow has become popular. Since a lot of people are talking about it, I figured I'd make a topic. It's called Baldi's Basics in Education and Learning. It apparently parodies those old "School Video Games" like I.M. Meen and 3D Dinosaur Adventure. 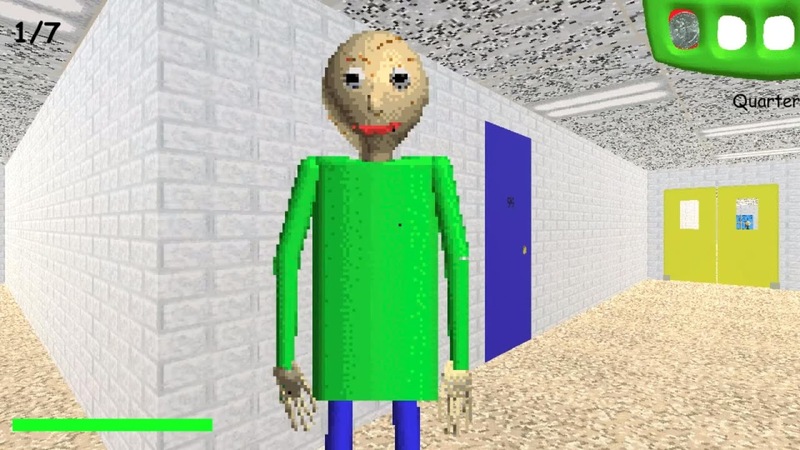 The game has you as a student at a grade school with a mostly bald teacher called Baldi. You have to find seven notebooks, and once finding each one, have to solve a short quiz of 3 simple math problems. However, once you get problems wrong, the games changes. Baldi will then start to chase you, and gets even faster if you get more wrong. And you'll inevitably fail some of the problems, for after the first quiz, the 3rd problem of each other quiz is just illegible static and glitched out text that cannot be solved correctly, making pursuit by Baldi unavoidable. Not only Baldi, but other things you'll have to avoid, like the Hall Monitor who sends you to detention for a few seconds if he catches you doing something against the rules, Playtime who forces you into a Jumping Rope Minigame, 1st Prize who is a cyborg who pushes you around, Gotta Sweep the Broom, the school bully, and more. You also have items you can use to help you too. The game is really poorly made, the characters are really badly drawn and look childish, the voice acting is terrible, and so much. I don't know why this game is so popular lately. Apparently it's supposed to be scary, but I don't see how badly drawn teachers who go BRRZERP at you if they catch you and cut/pasted imagery are scary. I was told it was originally made for a Video Game Making competition but was really last minute, and it certainly shows. Anyone else heard of Baldi's Basics?